Are you like me, who eats with your eyes first? 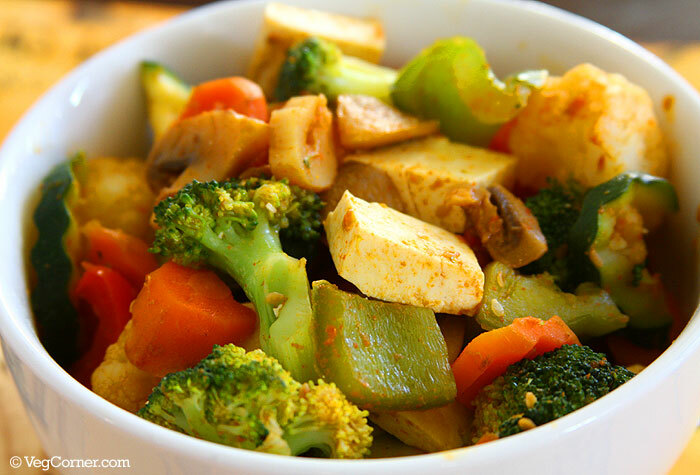 Then this vibrant vegetable stir-fry recipe is for you. Just like the colorful Jicama salad, this stir-fry not only looks amazing with all those lovely colorful vegetables, but tastes great too. I make this one-dish recipe quite often. My kids love it too. I usually make a big batch of this either in the morning for my breakfast and my son’s lunch or in the night for our dinner and his lunch for the next day. I usually just have the vegetables, but do mix in some cooked Quinoa/Brown Rice/Whole wheat pasta for the kids’ meal. If I plan to make it for breakfast, I prep the vegetables the previous night itself to save time in the morning. The measurements given for the ingredients is absolutely flexible. Use less or more of the vegetables you have in hand. I usually add yellow/orange peppers, yellow squash, beans, and scallions too. You can also top it off with some roasted whole cashew-nuts. 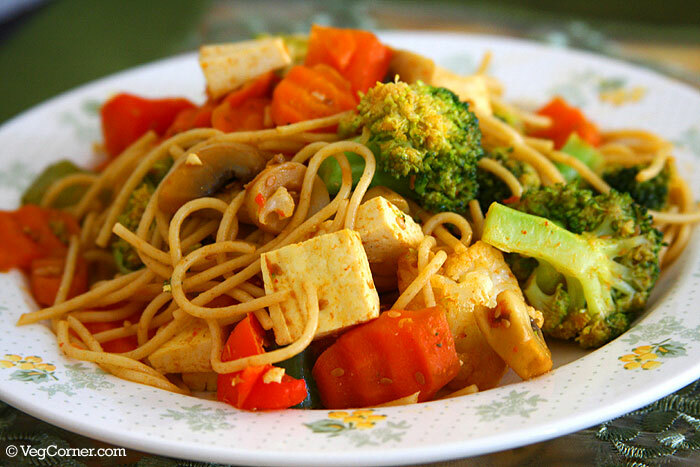 I add extra garlic and chili sauce in my portion which makes this dish even better. 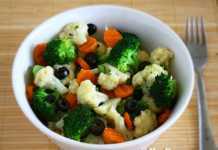 Steam the broccoli, cauliflower and carrots; set aside. Make sure that the vegetables do not get very mushy. Steam carrot for 2 minutes, cauliflower for 4 minutes and broccoli for only 5 minutes, so that they retain the crunch. In a large frying pan, heat the oil. Once it is warm enough add the sesame seeds and stir it for a minute. Do not let it burn. Next fry the chopped ginger and garlic. Add the curry paste and turmeric powder too and fry it for another minute. Now add the vegetables one at a time. 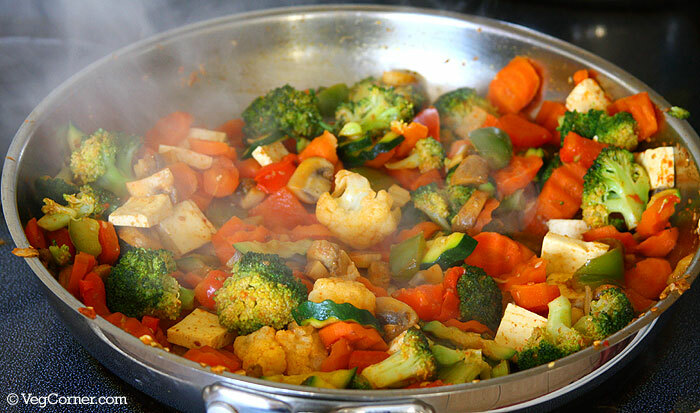 Add a tiny pinch of salt to ensure cook quicker and little soy sauce too while frying each vegetable. I usually start with the peppers, then sauteed the mushrooms, followed by zucchini. None of the vegetables should be cooked too much. Just sauteed a couple of times on high heat. 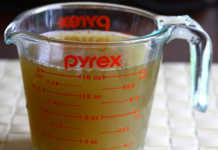 Adding a pinch of sugar will retain the color of the vegetables. Now add the steamed broccoli, cauliflower, carrots and cubed tofu. Add some more curry paste, soy sauce, and salt if needed and stir for another 4-5 minutes. At this stage add the cooked pasta (coated with oil and soy sauce), if using and stir well.